Many primate species exhibit high levels of behavioural variation that correlate with demographic variance across populations and within populations over time. Analyses of these relationships have typically treated behavioural variance as the product of individual responses to local ecological and demographic conditions and therefore indicative of behavioural flexibility. However, in contrast to the extrinsic nature of the variance in ecological conditions such as climate, food availability, or predation pressure, demographic variance can reflect both extrinsic processes and intrinsic properties of individual life histories, such as the timing and rate of fertility and dispersal decisions. If we follow the rationale for interpreting behavioural flexibility, then demographic flexibility would correspondingly reflect the responses of components of individual life histories that are free to vary to external stimuli. The dynamics between behavioural and demographic flexibility can shift over the course of individual lifespans and are expected to affect the size and composition of groups and populations and therefore levels of intrasexual competition and many other features of sociality. These dynamics also affect group and population growth rates, with implications for the recovery and management of small populations and the resilience of large populations subject to rapidly or unpredictably changing conditions. Longitudinal and cross-sectional data from the critically endangered northern muriqui (Brachyteles hypoxanthus) and other primate species provide comparative insights into patterns of behavioural and demographic flexibility that can advance our understanding of primate adaptive potentials and constraints over ecological and evolutionary time. 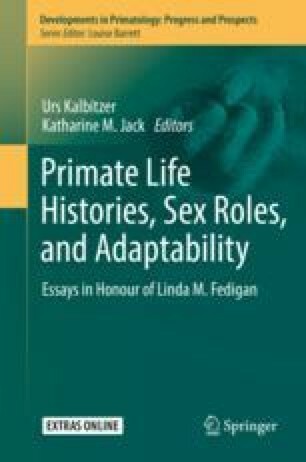 I thank Jeremy Hogan and other members of the planning committee for inviting me to participate in the Festschrift honouring Linda Fedigan in December 2016, where an earlier version of this paper was presented. I am also grateful to the editors of this volume and especially my editor, Kathy Jack, and to Louise Barrett and Phyllis Lee for their helpful comments as external reviewers. The muriqui data presented in this chapter were collected with permission from the Brazilian government (CNPq) and the Sociedade Preserve Muriqui, in collaboration with Dr. Sérgio Lucena Mendes, and with support from Conservation International and CI-Brasil. Many funding sources have financed parts of the fieldwork, and many people have contributed to the long-term demographic data; please see these acknowledgements at my website, https://strierlab.anthropology.wisc.edu/muriqui-project-of-caratinga-acknowledgements/.